This quality handmade mosaic shower tray is made in a grey/black marble stone mosaic bonded onto a backing tray. This manufacturing technology gives quality and strength with the added benefits of being a lot lighter than solid stone trays. 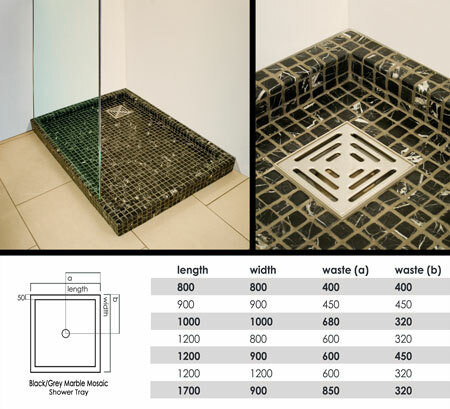 All shower trays are grouted with a hygienic epoxy and the stone mosaics are pre-sealed making the shower trays hygienic and easy to clean. Customer bespoke shower tray sizes can be made to special order.